If you have difficulty with spelling and grammar, then believe me, you are far from being the only one. 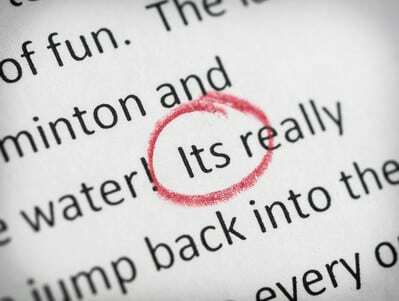 Even people who earn a living from writing make mistakes every day, hence the reason why they rely on proofreaders and editors. Popular word processing software like Microsoft Word is really good at picking up on spelling mistakes, and even basic grammatical errors, but that is where it ends. Despite English being my first language, and despite the fact that I am forever writing articles and blog posts, I too make mistakes all the time. Whenever I have finished writing an article, the very first thing I do is I check it for spelling errors and grammatical errors using online spelling and grammar checking software. Nine times out of ten I have to correct a number of errors. I have to correct a few spelling mistakes, I have to correct some grammatical errors, and yes, I often need to correct my punctuation as well. As is to be expected, there are numerous websites that offer spelling and grammar checking services. Many of these are free to use, while others are “members only” websites. Based on my own personal experience, most of the free services leave a lot to be desired. Programs like Microsoft Word are just as good, if not better. On the opposite side of the scale you have the sites where you have to pay for a subscription, and yes, you get the sort of results you would expect to get. However, if you only need to check a few documents every week or every month, then these sites might not be financially viable for you. Fortunately, there are some online services, such as Grammarly for example, that offer a free limited membership. As a non-paying member, you can use the software to check for spelling errors and critical grammatical errors, but it won’t help you to identify and correct what are deemed to be “advanced” grammatical errors. I have used various spelling and grammar checkers, and I can assure you, if you want the absolute best then you need to be willing to pay for a subscription. The free programs I have used in the past have been good at spotting spelling errors and even some easy-to-miss grammatical errors, but most have failed to correct my punctuation. Flawless punctuation is not going to help you sell your latest article or your latest book, and neither is it going to win you any awards. However, poor punctuation is going to make your work stand out, and I don’t mean stand out in a good sort of way. Extraneous Apostrophes – Many people use an apostrophe incorrectly when they want to pluralize something. They add an apostrophe, followed by the letter S, rather than just adding an S to the end of the word. To avoid this mistake, just remind yourself that an apostrophe indicates possession. For example, this is my dogÕs favorite toy. Quotation Marks – Incorrect use of quotation marks is a very common punctuation error. Many people, including many experienced writers, will use quotation marks to “emphasize” a particular word or phrase. I make this mistake quite often myself, despite the fact that I know it is wrong. Quotation marks should only ever be used when you are actually quoting something. If you want to emphasize a word or a phrase, you should rather use bold or italicized font. Insufficient Commas – Commas are your friend so don’t be afraid to use them, but also don’t overdo it. When you fail to use commas, sentences become almost robotic. To avoid this incredibly common mistake, simply read your work out aloud, and insert a comma whenever you have a brief pause, or whenever you take a breath of air between words. Comma Overload – There is no set rule regarding the number of times you can use commas in a sentence or in a paragraph, but using too many commas really can make your writing look ridiculous. Again, you can avoid this mistake by reading your work aloud and then inserting your commas whenever there’s a slight break between words. Exclamation Overload – Exclamation marks should really only be used when you want to leave the reader on a high point; when you really want to drive your message home. If you use too many exclamation marks in a block of text, they lose their value. Rather use them tastefully by saving them for when you really need to use them. Its, It’s or Its’ – This is another extremely common punctuation trap which many people fall into. Simply put, if you are talking about something or somebody, then the use of it’s is correct. Just remember that it’s is short for it is. In other words, if you can’t replace it’s with it is, then it’s wrong. Its’ on the other hand is always wrong and should never be used. Semi-Colons – A lot of people use semi-colons when they should in fact be using commas. To avoid making this mistake yourself, just remind yourself that commas represent very brief breaks between words or phrases, while semi-colons represent more definitive breaks. As such, they allow you to turn a group of words into a list within a sentence. In this article I have only mentioned and discussed a few of the most common punctuation errors, and I have tried to give some tips on how you can avoid making these errors yourself. If you still don’t trust your own judgment, then just go ahead and check your writing with one of the online spelling and grammar checkers.